Amber Performance are an Approved Forge Motorsport Reseller & Only sell 100% Genuine Forge Motorsport products. 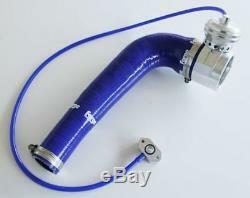 Blow Off Valve and Kit for Audi, VW, SEAT, and Skoda 1.2 TSI. Yet another first for Forge Motorsport! This valve kit allows the fitment of a fast response blow off valve on the 1.2 TSi engine CBZA and CBZB as found in the Seat Ibiza, Toledo, Altea, Leon, VW Polo, Caddy, New Beetle, Jetta, Touran, Golf, Skoda Yeti, Fabia, Octavia and the Audi A1 and A3. As the engine does not have a diverter valve fitted as standard, this valve not only gives you an incredible loud sound when lifting off the throttle during gear changes, but will also improve the throttle response by reducing any lag, as it will help the turbocharger maintain its rotational speed ready for when you accelerate. PLEASE NOTE: this will ONLY fit the 1.2 engine with code CBZA and CBZB - NOT the later CJZA and CJZB. Please specify at point of order what colour you require either Polished or Black. Please specify at point of order what colour silicone hoses you require either Red, Black or Blue. Make - Audi / VW / SEAT / Skoda Model - 1.2 TSI Engine Codes. The item "FMDV12VAG- Forge Motorsport Blow Off valve for VAG 1.2 TSI" is in sale since Wednesday, September 14, 2016. This item is in the category "Vehicle Parts & Accessories\Car Tuning & Styling\Other Car Tuning & Styling". The seller is "amber-performance" and is located in Luton, Bedfordshire. This item can be shipped worldwide.